How to go camping without the perils that regular camping brings? Go Glamping. In particular, go glamping in Loch Ness. Here at Loch Ness glamping we have created something special, the perfect middle ground between embracing a raw, wilderness camping experience whilst embracing those well-earned luxuries that make a holiday special, think more comfort, more excitement and much more enjoyment. 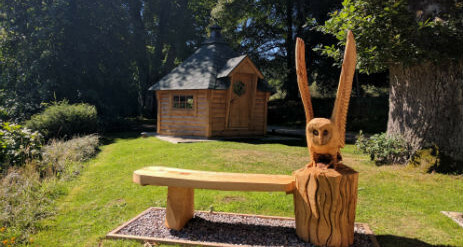 Loch Ness Glamping is a family run business, set in the heart of the Scottish Highlands, near the world-famous Loch Ness. Budget-priced like a hostel but with the facilities of a hotel or bed and breakfast, our aim is to provide a camping experience fit for everyone but giving you an extra helping of glamour and comfort. 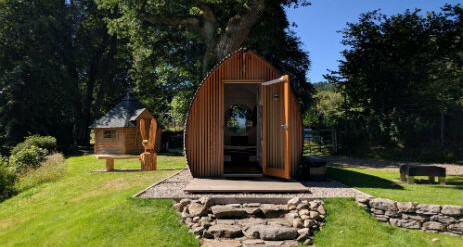 Clad in larch to blend in with the stunning landscape of Glenurquhart, our custom-built wooden eco-pods are en-suite equipped (shower and toilet) whilst also offering a fridge, tea-making facilities and your own LCD TV with DVD. 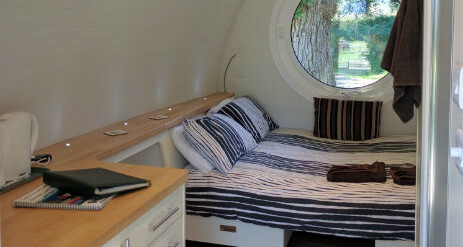 Gone are the days of chilly feet whilst camping, each pod is fitted with under floor heating as well. 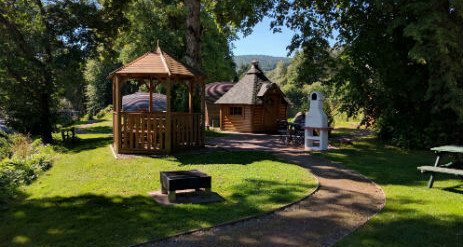 We have a total of six pods nestled between the rolling hills of the Glen with each having its own barbeque pit and area. British weather likes to foil our barbeque needs sometimes, because of this, we have shipped in two indoor barbeque houses all the way from Finland. Now you can barbeque in whatever the weather! 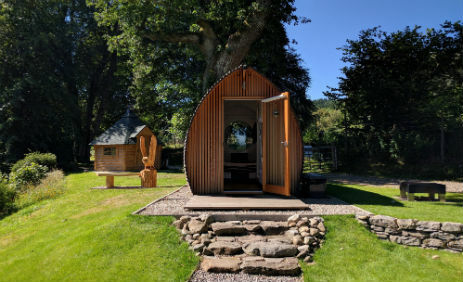 Our pods are even equipped with their own front decks overlooking the glen so you can sit back, eat, drink and take in the Scottish wilderness. There is a covered washing-up area, ample parking and some friendly neighbours to help entertain you. Granted, your neighbours aren’t just other people. You will be sharing this holiday with some Highland cows, Shetland sheep and some very human-like horses. Two of the pods that we have on offer are unique in what they offer. They are called the Armadilla Max and the Pent Pod. What makes them so special? Their size. Both these are bigger and have a higher spec than their other pod counterparts. Perfect for those extra special occasions. Not stopping there, we also provide one large family suite (which can still be used for couples if you want to be totally spoilt on your holiday), known as The Stables. An up-market suite set adjacent to the glamping site. With your own barbeque area, patio, hot tub and an infrared sauna. You can’t go wrong with this setup. Comfortable, glamorous and very affordable, we offer a range of tailor-made food options for your stay and can provide breakfast in the morning, delivered straight to your door. Or if you feel extra energetic, you can travel down to the local village for your morning coffee, Drumnadrochit, which is just a short bicycle ride away. Drumnadrochit is also the hub for the Loch Ness Monster Exhibitions, where you can book cruises to visit the famous waters and take a visit to Urquhart castle, which is situated on the shoreline of Loch Ness, transporting you back to the Medieval era. We are also just a short drive away from the capital of the Highlands, Inverness. And if you drive a bit further you will meet the Cairngorm mountains, which offers excellent walking, snowboarding and skiing opportunities to enhance your experience of glamping in the Scottish Highlands. There are always things to do in the highlands whatever the season and now that glamping has arrived there is absolutely no reason not to go out and do it! We can design a package to suit your holiday style and introduce a note of luxury to your glamping excursion. We are already known for our excellent hospitality at our Great Glen Bed & Breakfast accommodation and we bring the same high level of service and attention to the needs of our guests with our new glamorous camping venture. For pet-friendly and child-friendly holiday accommodation near Loch Ness, our Highland glamping experience just can’t be beaten! 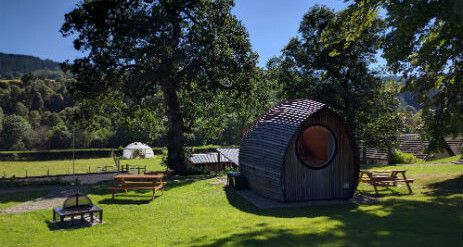 If you want to keep the camping feel but not want the ‘hates’ that come with it, look no further than Loch Ness Glamping. We can’t wait to welcome you to our complex! 6 exclusive Armadillas set within the backdrop of the Great Glen and surrounded by world renowned nature in all its highland splendour. This is the most glamorous adventure you may ever experience! If families wish to stay in the Armadillas with children they will need to book Armadillas 3 and 4, which are next door to each other. Friday/Saturday night bookings £8.00 supplement for all armadillas. All our Armadillas are Double / Twin. The Max and Pent Pod have the option to have a roll up mattress on the floor for an extra £12.00 charge. A stone’s throw from the Armadillas, set within our horse haven. The Stables offers a larger layout with extra amenities perfect for families or those looking for a whole lot more. With its own kitchen, self-catering is also an option on your highland experience. We also provide a private BBQ and fire pit for each Armadilla and lodge as well as a shared covered eating area and indoor BBQ facility. The Stables have their own private under cover eating area. 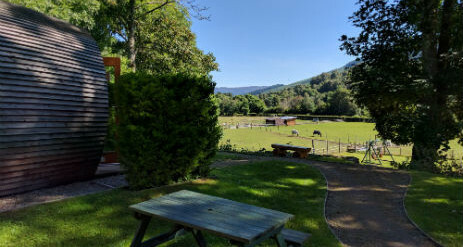 There is a lit, under cover washing-up area, ample parking … and some friendly neighbours to help entertain you; granted, they are Highland cows, Shetland sheep and some very human-like horses – but what better way to be welcomed into the stunning Great Glen? We have organic home reared meat available to purchase as well as home grown salad and vegetable options in season. There is a small supermarket in the village, open until 10pm. The village takeaway will deliver food to your door. We have seven restaurants in the village, two of which offer a free pick up and return service. One of these – Cobbs Restaurant – has a great view of loch ness. Book your free transport yourself, or we can arrange it for you on request. We also provide vegetarian and vegan breakfast options. Dogs are welcome: there is a £5 charge per night for a dog.